Red apples, raspberries, plums and a cocoa finish. The Ngugu-ini Washsing station (or factory as it called in Kenya) was built in 1958, is owned by the Kibirigwi Cooperative Society. This society is the second largest in the county, with eight washing stations and 7,200 members, 1,200 of whom deliver to the Ngugu-ini washing station. Ngugu-ini is situated at 1,600m above sea level, with an average temperature range of 12-24°C. The mild climate and high altitude means that the coffee cherries grown in this region are able to mature slowly, allowing time for a high concentration of the sugars to develop in the fruit. The region receives an annual rainfall of 1300mm, and is covered in red volcanic soil which boasts lush topography and voluminous coffee production. Harvest season occurs from May–June and again in November–December, with the most common varieties being SL-34, SL-28, Batian, and Ruiru 11. Ngugi-ini adheres to stringent quality-driven practices at the washing station to ensure the very best coffee is produced, overseen by Factory Manager, Simon Peter Mathenge. All the coffee is hand-picked and delivered on the same day to the washing station, where it undergoes meticulous sorting. This is also done by hand, and is overseen by the ‘cherry clerk’ who ensures any unripe and damaged cherries are removed. A disc pulping machine then removes the skin and pulp, and grades by density into three grades. Grades one and two go separately to the fermentation process: grade three is considered low grade. The coffee is then fermented for 16-24 hours under closed shade, to break down the sugars and remove the mucilage (sticky fruit covering) from the outside of the beans. They are then sent to tanks where they are dry fermented for a further 16-18 hours, with intermediate washing, stirring, and draining every 6–8 hours. This process increases the proteins and amino acids, which in turn heightens the complexity of the acidity. The parchment covered coffee is then washed with fresh water, sent through water channels for grading by weight (the sinking coffee is considered the sweetest, and any lighter density or lower grade coffee beans are removed). The beans are then sent to soaking tanks where they sit under water for a further 24 hours. Afterwards, the coffee is dried on hessian mesh mats for up to one day. The beans are then spread out on the raised drying tables and turned constantly to ensure they are dried evenly in the sun. The coffee is covered in plastic during midday and at night, but time on the drying tables depends on weather, ambient temperature and processing volume: it can take from 7 to 21 days in total. Wastewater from the processing is managed through the use of soaking pits. The water used for processing the cherry will spend time in the pits to ensure that the nutrient-rich water created during de-pulping will not be returned to the nearby water source without proper treatment. This additional step will cut down the risk of contamination, after adequate time for reabsorption, the water will be recirculated. 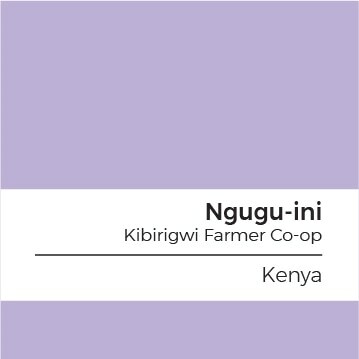 The members of the Ngugu-ini Factory also invest in and carry out agronomic activities associated with coffee production. They source coffee from the Coffee Research Station and plant it according to the specific guidelines. Fieldwork is carried out, often involving weeding, pruning, spraying, mulching, and applying fertiliser. Technical advice is presented through farmer training programs and field interactions offered by the ministry of agriculture. The field committee visits the farms to ensure their agreed guidelines are being complied with. They usually check that the coffee is not inter-grown with other crops such as maize, but they do allow intercropping with Macadamia. 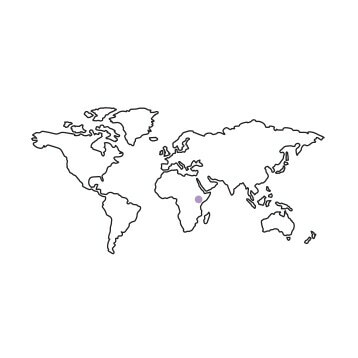 Ngugu-ini has long-term goals to increase their coffee production, training seminars, and access to education and sustainable processes for all the farmers they work with. They also maintain a demonstration plot that farmers can visit and reference in relation to their own plots. The Kenyan dry mills are highly professional and efficient, with standard grading systems which grade the coffee acoording the the size of the bean and quality. The definition clearly defines the size, and to some extent, it is assumed the quality is linked to the size of the bean. While this is often true – AA lots (screen size 18+) are often superior coffees – however in this case we found the AB lot to be exceptional, with intense sweetness, muddled berries and complex fruit and acid structure. This particular lot was 50 cartons in size, and we are extremely excited to share it with you.